roasted squash and kale salad Archives - Bring It! Be the best guest on the block. To borrow a sentiment from Teen Angst, “what the world needs now is another kale salad like I need a hole in my head” And yet, here you have it. This came out of the Cooking Light archives—an actual print version that was hanging around my cluttered pantry of angst. It was the answer to my prayers when my garden of tomatoes died back enough to reveal a whole lot of kabocha (buttercup) and delicata squash. I’ve made this with both types of squash and it was fantastic. I suspect it’d be grand with butternut as well. To make this meal-worthy salad you’re basically massaging up a bed of kale with a touch of olive oil. Now don’t be coy—we’re no strangers to massaging kale. Roasted squash goes on top of that, followed by thinly sliced red onion for sass and plumped up dried cranberries for a little sweet and same fall color. It took all my will NOT add nuts to this bed of goodness, but I resisted and did not miss them a bit. Neither did my nut-weary family. Bonus: This can be made ahead and hang out until dinner is served. Double Bonus: It travels like a champ and is easily assembled on site. Triple bonus: The leftovers are excellent, because we all know dressed kale can survive the apocalypse. Combine squash, 1 tablespoon olive oil, coriander seeds, pepper, and 1/4 teaspoon salt in a large bowl, tossing gently with hands to coat. Spread in a single layer on a baking sheet. Cover with foil. Bake at 375°F for 10 minutes. Remove foil; bake 15 more minutes or until pumpkin is tender and browned, turning once. While pumpkin roasts, combine cranberries, vinegar, brown sugar, mustard seeds, and 1/8 teaspoon salt in a small skillet over medium-low heat. Bring to a simmer; remove from heat. Steep 15 minutes or until almost all of the liquid is absorbed. Toss lemon juice, kale, remaining 1 tablespoon olive oil, and remaining 1/8 teaspoon salt in a large bowl, massaging kale with hands to soften. Transfer kale to a large serving platter; top with pumpkin and onion. Sprinkle with cranberries. 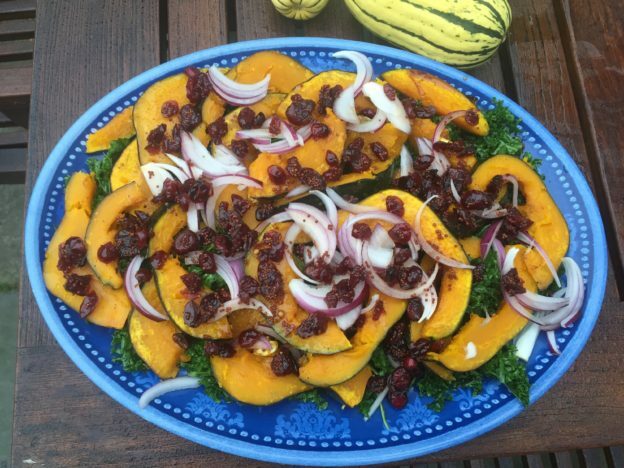 Bringing it: Roast the squash, prep onions and cranberries and massage the kale in the privacy of your own home. Bring them all separately and assemble on a platter when you get to your destination. It can hang out until you’re ready to eat. This entry was posted in Salads and Sides, Start it up, Veggie Delight and tagged fall salad, kabocha squash, kale salad, roasted squash and kale salad, Thanksgiving sides on October 17, 2018 by Edie Morgan. Like it? Enter your email address below and get every Bring It post delivered to your inbox. This blog is dedicated to good eating, good guesting and good living. We're all about fuss-free, (mostly) healthy and always yummy recipes that are easy to prepare and BRING anywhere. As we build the Bring It! repertoire we'd love to hear from you. Log in to post a comment or just shoot us an email at bringiteats@gmail.com. Thanks for reading! The Aperol Spritz: Ciao Bella! Holiday Favorites: Stay Sane, Go Nuts, Be Happy!